One year ago, Ocean Township took advantage of a Federal grant. They banned parking on Sunset Avenue beginning at the bridge with Asbury Park. On the AP side there were many cars parked, but on the Ocean Twp. side, there were none. What a striking difference! Instead, on the Ocean Twp. 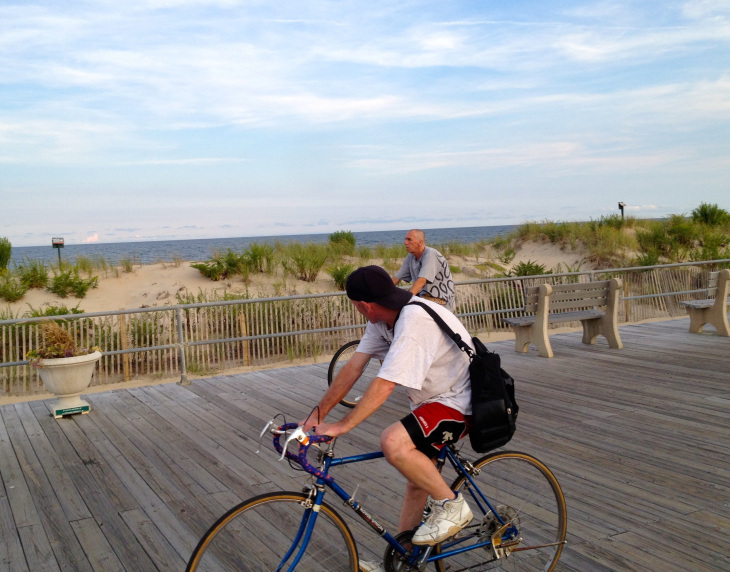 side of the bridge, bike lanes were established on both sides, and bikers were welcomed — an unusual development for a Jersey Shore town. A woman on a two wheeler was pulling a bicycle caboose with shade, screens, and a toddler inside as she headed towards Asbury. Then a string of about 6 bikers were spotted happily and safely following the bike lane heading west. The car -free avenue extends to Logan Avenue and then to Deal Road. We spoke to a resident who said that the car-less avenue did not create parking problems down the side streets, but this area has no beach, and houses have driveways and garages. The bikers were very pleased. He pointed out that bike riders in most towns have challenges. If there is parallel parking, a sudden door opening can abruptly stop a passing bicyclist. 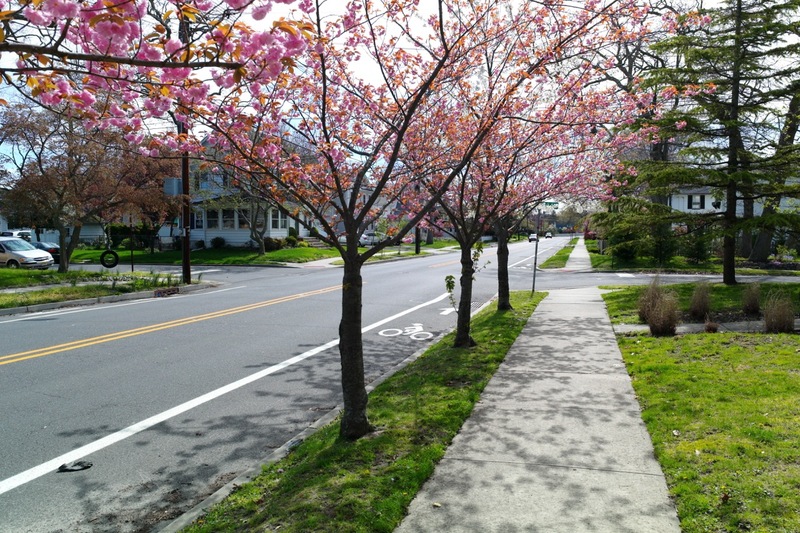 As a result, in such locations such as Belmar bikers are often seen peddling down the middle of the street, creating other hazards And where there is diagonal parking, the space left for bikes forces them to the middle as well, or onto the sidewalks. 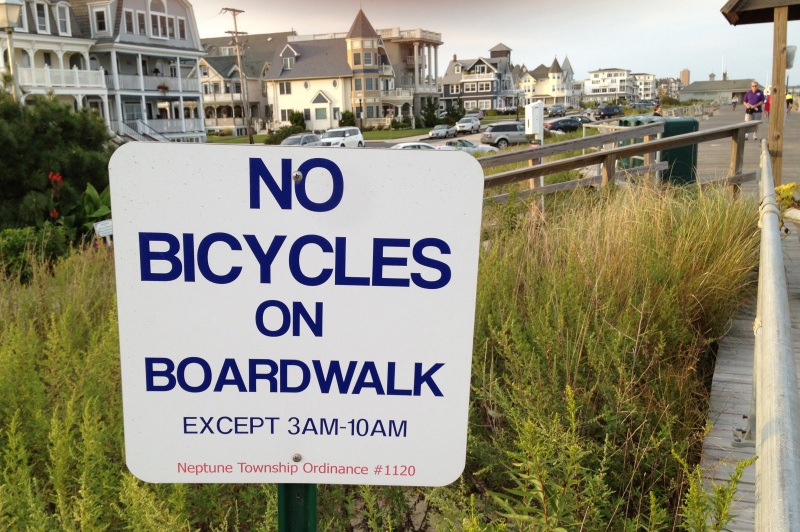 We have bicycles in the Grove, but the best bet is to go on the boardwalk during appropriate hours, such as 3 am to 10 am. Otherwise, cycling is a bit hazardous all around town. Not only do we have diagonal and parallel parking of many cars, but our side streets are a maze with unpredictable stop signs all over and cars whizzing about like at a chariot race. Also, our parking situation in OG is so bad, that we seem to have little interest in the fate of bicyclists. Despite this, peddling around town is a popular social activity, but without the high speeders in spandex who sometimes race through the Grove, on the way to elsewhere. However for the slow-pokes and the kids, it is a holly-jolly thing to do–but be careful. As for our parking problems, the Township Parking Task Force is busy trying to create more spaces by making our town more ugly. And the Township continues to promote high density construction projects without parking. What we need are innovative ways to lessen the number of cars in town; those ways have been discussed on Blogfinger. That would encourage more bikers. Let Sunset Avenue in Ocean Twp. be an inspiration if not a direct roll model. 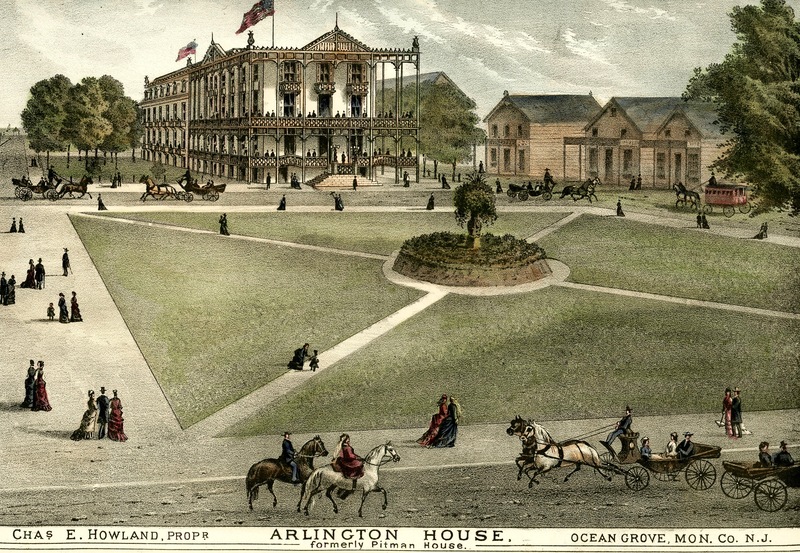 Editor’s note in response to Tom Costantino’s fanciful alternative narrative about parking in the Grove (see Tom’s comment; click below) see the etching below which shows a historic Ocean Grove without a single horse or buggy parked on the lovely streets depicted. Those founders made sure there was parking then by placing stables near the entrance to town. One was where the Embury Arms now take up an entire block with private parking, and the other was west of Delaware Avenue in the North End of town. Our parking problems cannot be fixed without less cars in town. For starters, let the sponsors of those huge events (i.e. the CMA and the Chamber of Commerce) provide parking out of the gates, with a steady stream of buses in and out. Then let’s cancel some of those street clogging mega-sales and substitute events that are for the citizens of Ocean Grove, such as concerts in the parks, art sales for local artists,garden tours, poetry readings, film festivals, historic reenactments, town-wide yard sale, etc. And we should offer relief to the homeowners with parking stickers. And we need a solution to the motorized invasion by those parkers heading for A. Park. This summer those Asbury meters will be operable until 2 am every day, putting even more pressure on our limited parking in the Grove.